Sydney Shop Girl: Liz Hurley's White Jeans. Taking A Punt on Phantoms. Liz Hurley's White Jeans. Taking A Punt on Phantoms. Does anyone else ever look at their fingernails and wonder, how and why? It's actually very relaxing having a visual to focus on as you engage in a little deep breathing and attempt to clear your mind of the trivial and irrelevant. I'm at work, having a little quiet time and taking a break from researching topics I need to reaaquaint myself with for the coming week. As your mind clears and your posture becomes less stooped, your personal existential journey begins. How did I get that French manicure? Are those fingernails really mine? White really suits my skin tone. I really need a pair of white jeans this spring. Do I realize how much maintenence is involved with white nail polish and clothing? Which is where Liz or should that be Elizabeth Hurley comes into the picture. I haven't kept myself fully up to date with New Idea, Women's Day or Hello so I'm not sure exactly where Liz is at with her life at the moment beyond being a mum, in a relationship and having a swimwear line. I do know that she has moved on from the safety pin dress and Hugh Grant. Possibly onward to sheer saris, as the The Daily Mail noted on February 24 2010. But surely the white jeans will be forever? Is there just the one pair that is immaculately laundered by her full time maid or does she have 10 identical pairs (possibly also maintained by said maid) that fly everywhere with her? Were they from the denim floor at Bloomingdales in Manhattan? The place where every woman can find a pair of jeans that instantly make them look taller and thinner. And then go to the ground floor and buy MAC and Kiehl's at what appear to be wholesale prices for visiting Australians. It is all open to conjecture and speculation - Liz's jeans that is (not the superior shopping experience that is Bloomingdales). Liz started being a celebrity way back in the day when the precise details of an actress's wardrobe wasn't widely known in the public domain. Back when supermodels not actresses graced fashion spreads, cosmetic campaigns and the covers of the glossy magazines. When the famous and genetically blessed knew their turf and stuck to it. However, now is not the time to be wallowing in the past. So I was browsing on Revolve today (of the free international shipping fame) and found myself a pair of white skinny leg jeans. They are by Citizens of Humanity and they are called Phantom. After a bit of googling, I discovered that Kourtney Kardashian wears them. She's curvy by Hollywood standards and has just had a baby. She looks radiant and as close to 'a really well toned normal woman' as she'll ever be - within weeks she'll return to her pre-baby perfect body. So as not to be completely star struck, I also noted that there were also favourable reviews by Revolve customers. I took the plunge and bought them. I'll have a chat about them when they arrive. In the meantime, what about the AFL Grand Final today?!? A hung parliament and now a hung Grand Final. Which means we all get to relive the traditional Grand Final festivities next Saturday. This time around, the AFL Commission has decided that they will play into extra time should there be another tie. Good times and a result in just over two hours. Perhaps hung parliaments should be managed in a similar fashion. I wonder how the teams are faring? The build up to the game today and then the news that they will have to do it all again next weekend. I don't think the fans will mind. It's a dream come true for some AFL fans I know - 2 consecutive weekends in front of the television with a supply of pizza, chips, party pies and beer for sustenence. I am so sorely tempted to fly to Melbourne that weekend as it will be a long weekend in Sydney. I love white Jeans very, very much - and have quite a lot of them. They give me the St. Tropez-Feeling I had as a very young girl, when we were often there, dancing the Sirtaki (now you can count backwards ;-) - and all the chic French boys and girls had them, of course. I do believe that white is no more problematic to keep then other colours (I even own a white winter coat - no problem). The only thing I abstain from are white shoes, though I have really tiny feet (38 or 5) for my height (1.78m), I think they optically enlarge feet - why should I do that? So congratulation for your new chic pair, you will certainly enjoy them! 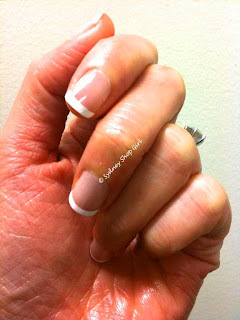 I love the look of a French manicure but fear that my gardening (even in gloves) would destroy this in a heartbeat! Time for reflection is a great way to refocus...and whatever prompts you...whether it's nails or something seen through the window...it's healthy to take a break. SSG I have the good oil on Liz. She spends half of her time on her farm in the Cotswold's where she farms organic sheep or cows or something. She also has a flat in London somewhere.She is still the darling of the English press and after spending quite some time there this year I got a bit fed up with reading about her! White jeans AND cleavage featured predominantly in the accompanying photos. I love a white jean and have at least 5 pairs. Of course you can only get one wear out of them but I find if I wash them separately with a bit of Napisan they come up a treat! Re: football. Ms Gillard made a joke about it better not be a tie and look what happened! Mr B thinks he will snag a ticket and go but I think there is no chance. Britta: I completely agree about that St Tropez feeling. I have never been but I will be there in spirit with the jeans. Hostess: yes, manicures have a finite lifespan with me too. Kate B: thank you, thank you, thank you!! Together we have let Australia know that Liz Hurley is still a media darling somewhere in the world. Thanks to for unity on white jeans for real women. We could have a chance with GF tickets you know. General sales are on Wednesday. Surely everyone who was there yesterday won't have it in them to be there again next week?